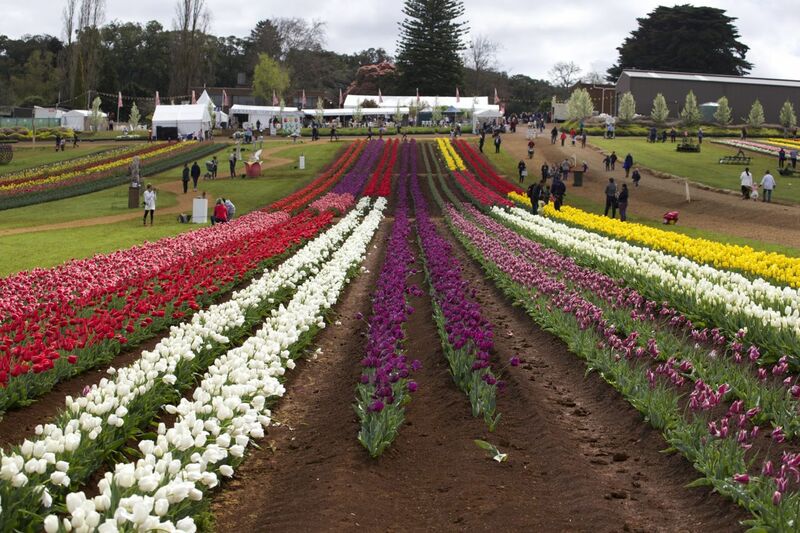 The Tesselaar Tulip Festival celebrates the advent of Spring in Melbourne. 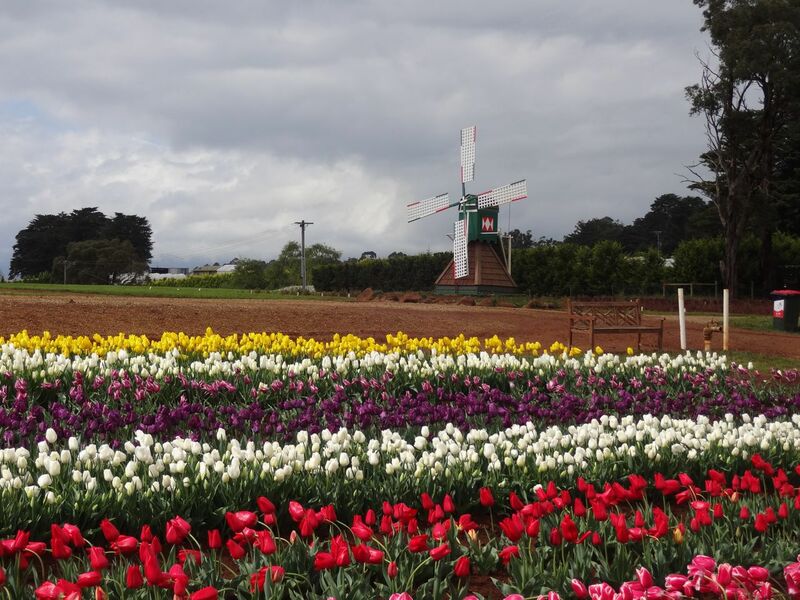 Held at the family owned and operated Tesselaar Flower Farm in the Dandenong Ranges, Silvan; it is a celebration of tulips and the Dutch community in Australia. 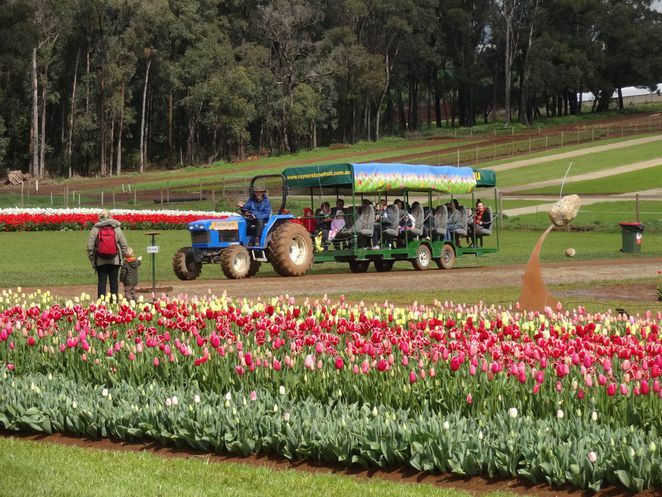 Every year between mid September and early October, the Tesselaar Flower Farm opens its gates and provides a selection of outdoor art, market stalls, live entertainment and food amongst rows and rows of stunning tulips. Sculpture exhibit. Outdoor art is set amongst the rows of flowers and all pieces are available for purchase (Excluding windmills). Free live entertainment runs all day on one of two stages and around the festival area. Go on a fairy hunt and discover the real fairy hiding in her fairy garden. We found her sitting in a tree in the fairy garden near the wishing well. Free craft activities for young children. Try on the giant clogs. Real, traditional wooden clogs are also available for purchase in the Clog Shop. Face painting. The artwork is great, but at $10 per face was a bit pricey. Tractor rides around the farm at an additional cost of $6 per adult and $5 per child. Market stalls and Souvenir shop. 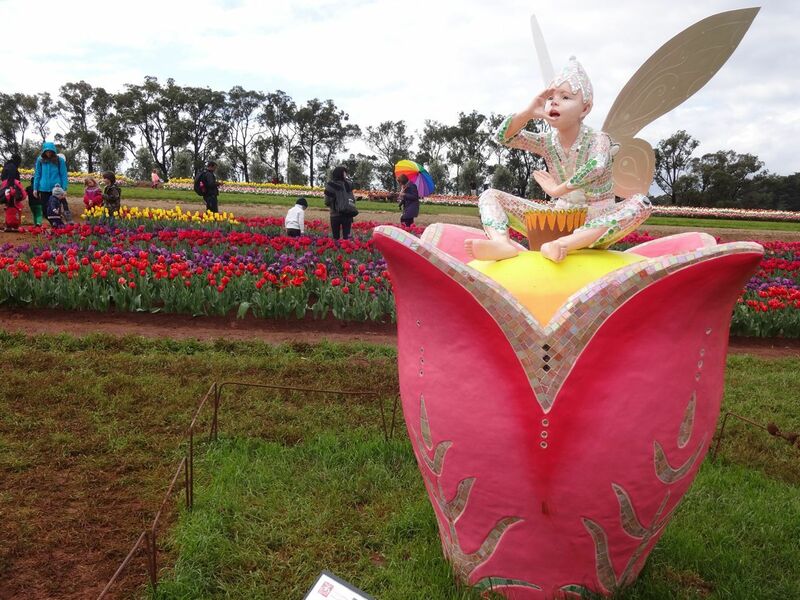 The area between the tulip rows and festival activity is not far. The festival is a safe environment away from cars and roads with a friendly, family atmosphere for toddlers to confidently run free. Pushers and strollers are great for carting around drink bottles and food, but please remember this is a farm and the wheels (along with shoes) got very muddy. This is an entirely outdoor event. Dress according to the weather and be sure to have a coat and umbrella on cooler days and umbrella or sun hat on bright, sunny days. Gumboots or change of shoes for the kids. A picnic lunch and drink bottle are highly recommended. Change of shoes! This is a farm and the soil is dense clay. Lots of kids were wearing gumboots and they were coated with clay. Umbrella and coat. The Dandenong Ranges are usually slightly cooler than the suburbs and there is no shelter from even light drizzle. Sun protection. This event provides very little shade and shelter. Camera. So many amazing, colourful opportunities, you really can't take a bad shot. Easy, open access. Mostly flat, except along the rows of tulip beds, which are situated on a slight hill. Elevated, portable toilets. Please consult venue with regards to disability toilet facilities. There were plenty of food stalls available, including (but not limited to) poffertjes, roasted nuts, curly potatoes on sticks, wood fired pizzas, traditional Dutch fish bites and ice cream. There was also a dine-in café. Food prices were high. With lots of plastic tables and chairs available around the main stage area, I'd suggest taking a picnic. On a fine day you could even throw a picnic blanket down on the grass right next to the tulip beds, if you were so inclined, and eat amongst the blooms. The car park is close and accessible enough that you needn't lug lunch around with you all day. Go back and fetch it come lunchtime, just remember to get a pass-out stamp on your hand before you leave. Alternatively, there are some lovely bakeries, cafes, even a Woolworths supermarket in nearby Monbulk. **NO BBQ or cooking facilities. Flowers, plants and bulbs were all available for purchase on the day. Souvenirs and a small number of novelty market stalls. 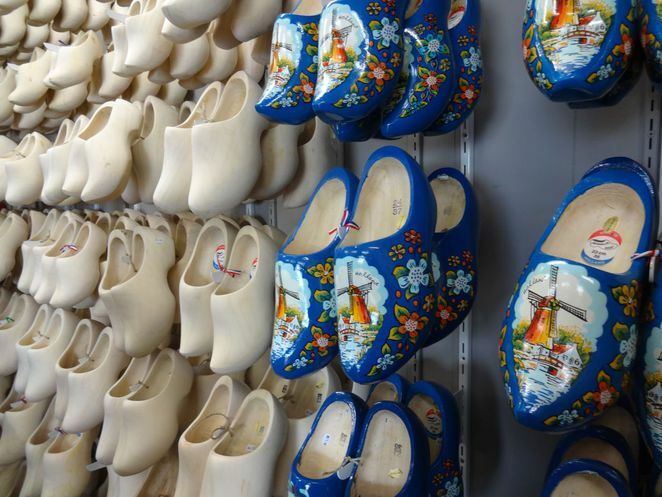 Traditional wooden clogs, either painted or raw were also available. The event generally runs from mid September to early October and is open between 10am – 5pm daily. You could spend as little or as long as you like just wandering the garden or sitting beneath the trees listening to the live entertainment. Take your time, wander slowly and make a good day of it. 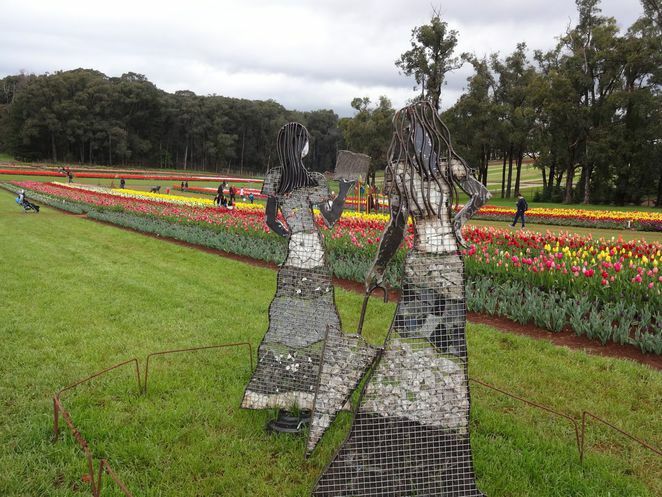 The Tesselaar Flower Farm is located opposite the Silvan Dam. This park features BBQ facilities, lots of tables both covered and open, playground and vast open green spaces for running or ball sports. Wander the shops at Monbulk and have a coffee at a café or bakery along the main street or in a small park nearby. Enjoy a coffee inside a real, old-fashioned train at the Carriage Café in Seville.